Blackstone-NEY Ultrasonics produces weld-in and gasketed transducer plates for attachment in OEM equipment applications. Custom sizes, shapes and contours can be accommodated using our proprietary transducer technology. 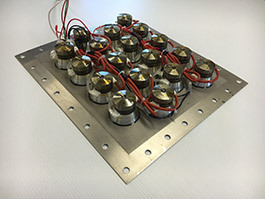 Transducer plates are supplied complete with matching ultrasonic generators providing either single frequency or multiple frequency operation. Contact the Blackstone-NEY Ultrasonics sales team for further information.